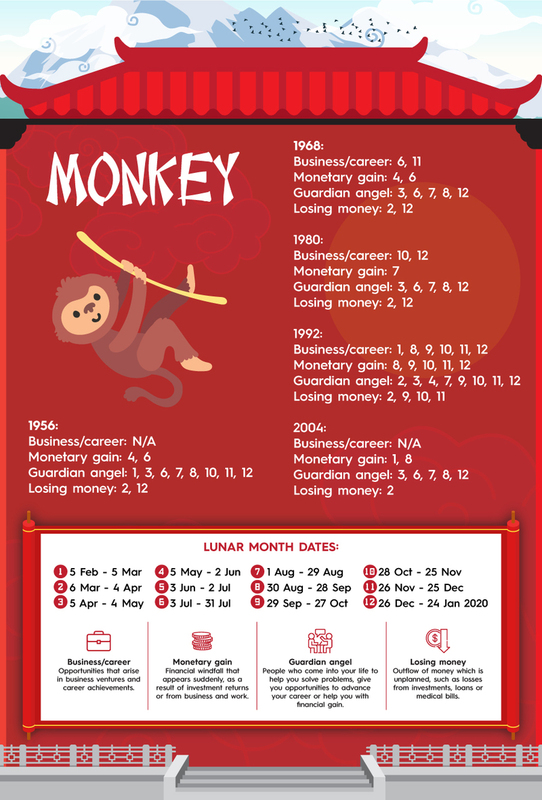 Chinese Zodiac Prediction for 2019: Will Your Fortune Be Good or Bad This Year? 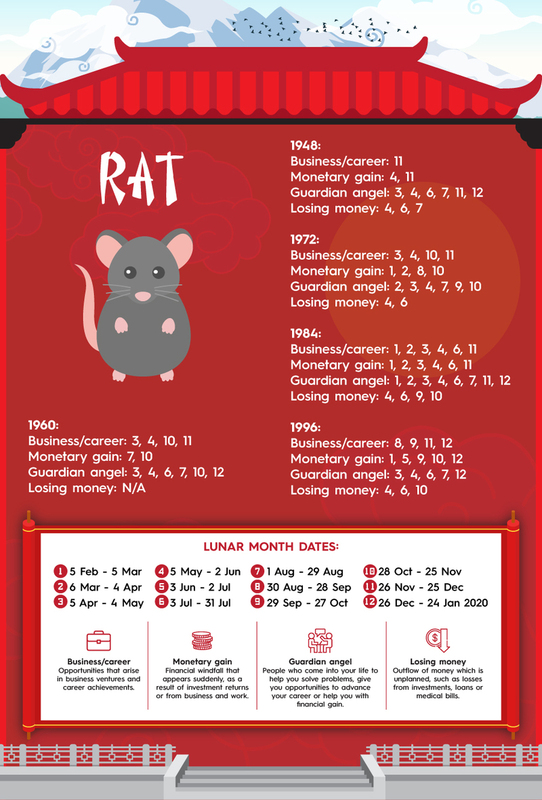 Chinese New Year 2019 is the year of the Pig, which is the twelfth of all zodiac animals. 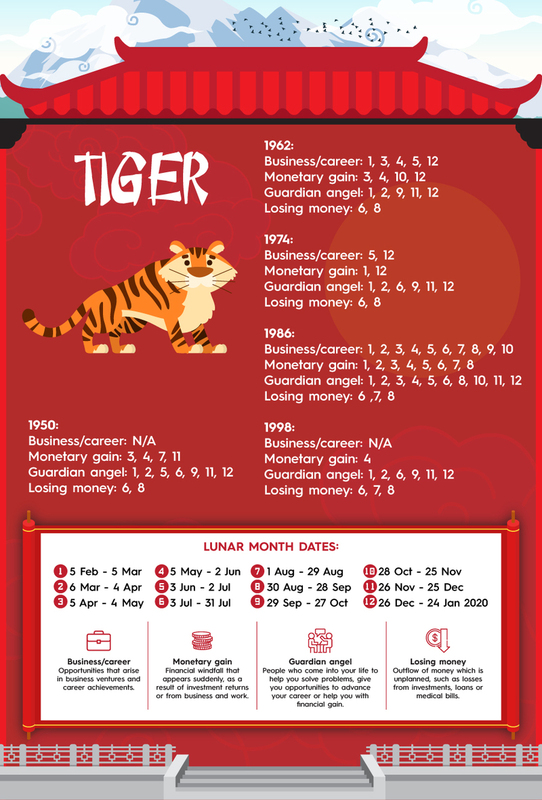 According to a popular version of the myth, the Jade Emperor said the order of the Chinese zodiac would be decided by the order in which they arrived at His palace. Since the Pig overslept, it was late, and thus arrived last. However, instead of symbolising laziness, the Pig in Chinese culture is a symbol of wealth and good fortune. Who would've thought! 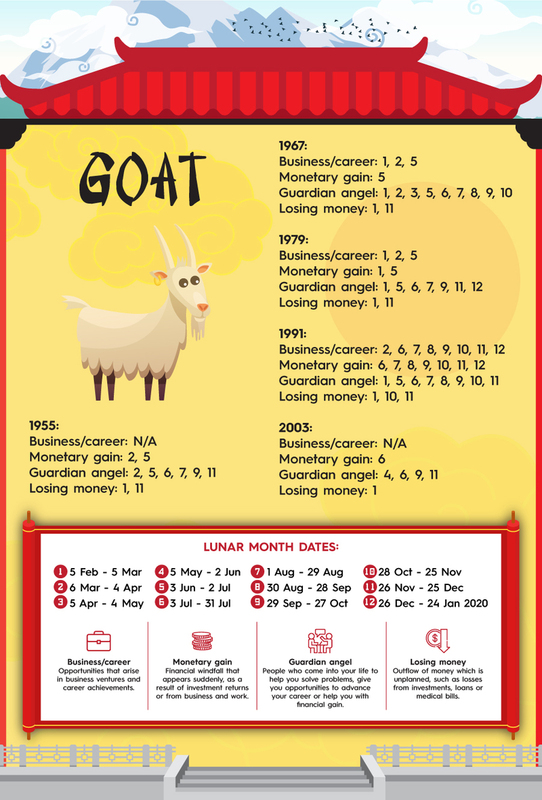 Without further ado, join us as we take a look at the fortunes of not just the Pig, but all 12 of the Chinese zodiac animals for 2019, courtesy of information from the 2019 Year of Boar Outlook, a book by Malaysian Institute of Geomancy Sciences (MINGS) president Prof. Joe Choo! This year, the presence of major lucky stars indicate that you may receive help from many benefactors; they will help resolve even the greatest obstacles in all aspects of your life. Your career luck will be outstanding and you may meet benefactors from the other gender who will help with work issues. 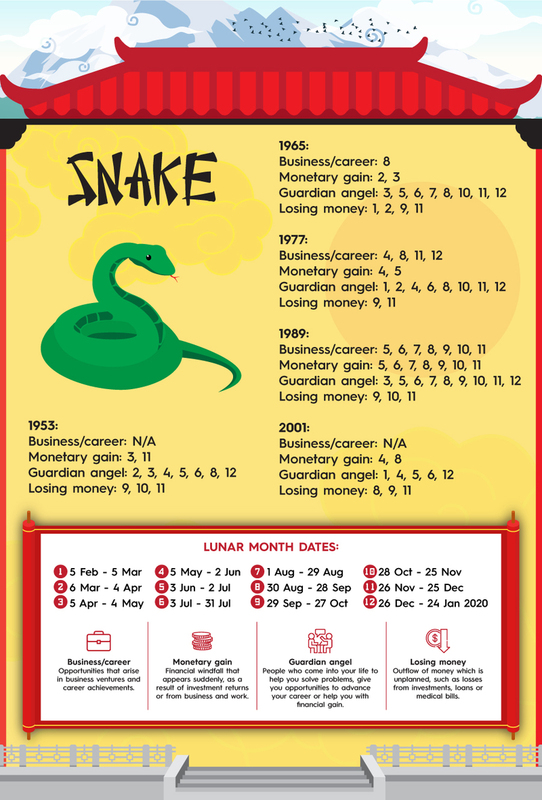 However, the appearance of certain unlucky stars may negatively affect your wealth and health. Take care of your belongings and stay alert when outdoors to avoid accident or injury. 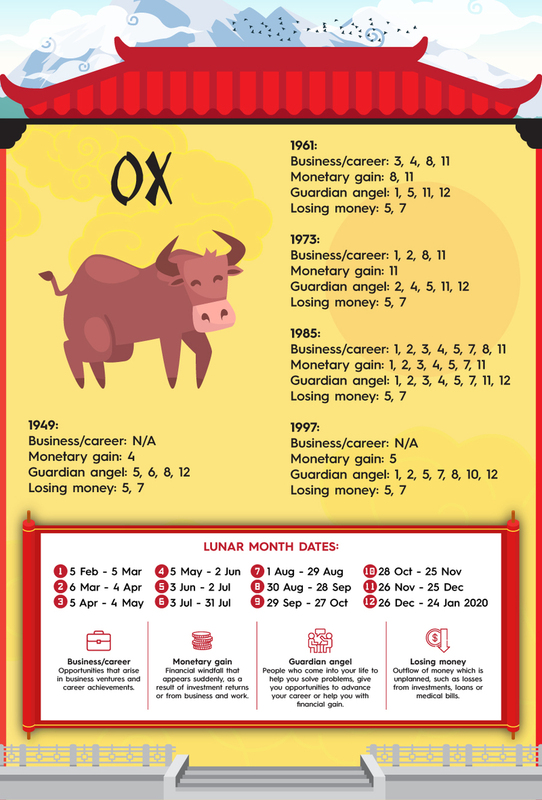 Without many lucky stars in sight, your overall luck this year is bleak and you may frequently feel distressed. You must adopt a cautious manner and refrain from offending anyone lest it affect your career, studies or interpersonal relationships. Try to avoid major changes such as moving house, or conducting renovations to avoid any possible accidents or injuries. You'll have middling luck this year, but will enjoy excellent interpersonal relationships. As a result, opportunities and support abound in all aspects of your life. Romance luck is positive, but you must remain steadfast and clear-headed. You are likely to be more distracted this year, so it's best to avoid major changes to your lifestyle or environment. Lastly, remember to undergo regular health check-ups and refrain from risky activities. 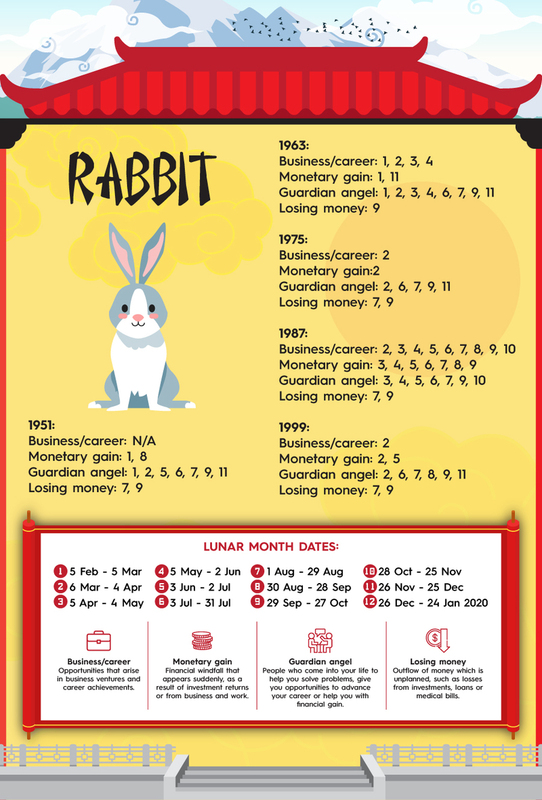 Considered a lucky year for Rabbits, you'll have a rewarding time in your career, studies and wealth. However, you may also encounter legal conflicts, so make sure you stay on the right side of the law. You may be tempted by promises of wealth and power, so stay grounded and remember to maintain a balance between career and personal life. Several lucky stars gather for the Dragon this year, heralding good fortune and bliss. You may meet benefactors who'll help you resolve difficulties. Love is also likely to blossom and you may even meet your life partner. There are also chances of you being presented with opportunities to work or even live overseas, and you should consider them. Nevertheless, be wary of jealous individuals who may try to sabotage you. The gathering of unlucky stars mark a difficult year and you may encounter challenges in all aspects of life. Still, there are a few lucky stars to aid you in neutralising bad luck and help you have a smoother journey in this turbulent year. 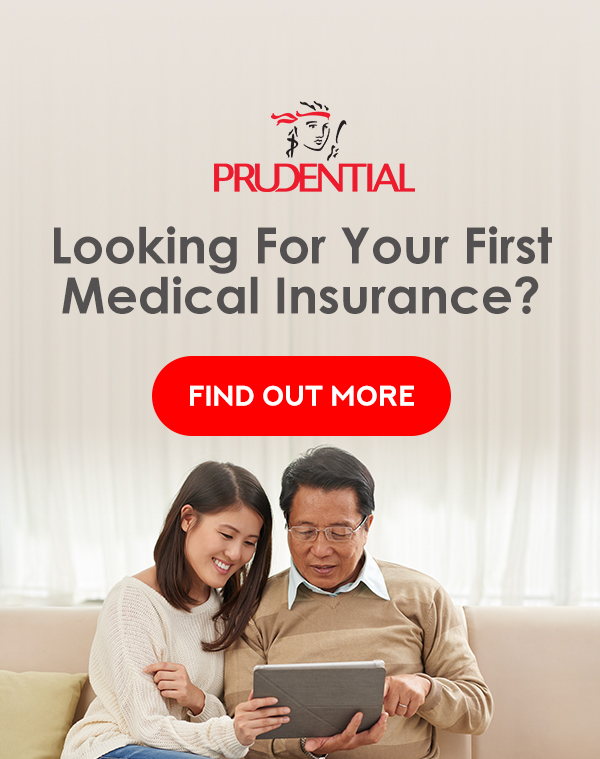 Your best chances for growth are across borders, but you must consider your loved ones when deciding to go overseas. Pay more attention to elders in your family so that they may enjoy their golden years. 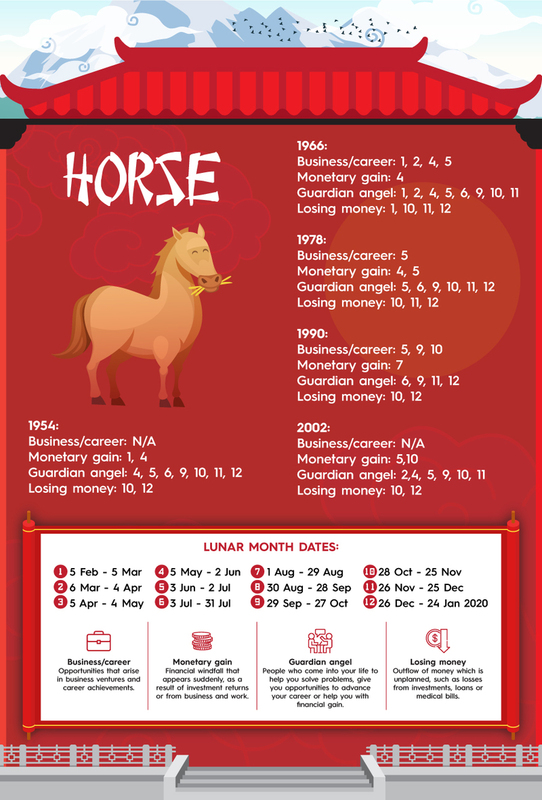 Those born in the year of the Horse are welcomed to 2019 by major lucky stars, signifying a smooth-sailing year filled with benefactors for your career and wealth. 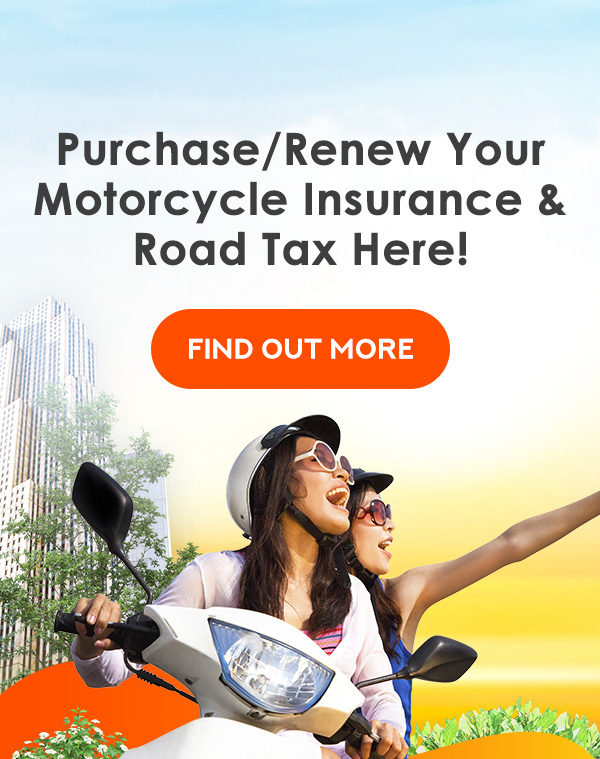 However, you may face sudden blows in the form of unexpected disasters or accidents. You should adopt healthy financial habits and save up for emergencies. Your health and spirits fluctuate this year, which will affect your interpersonal relationships. With no lucky stars to light your way and numerous unlucky stars, this shall be a trying year for you. While you may possess unbounded creativity, you have to wait patiently for someone to discover your talents. You should be more proactive in helping out with chores at home and be less quick-tempered; these will help in maintaining harmony. Pay attention to safety when outside, especially when driving. 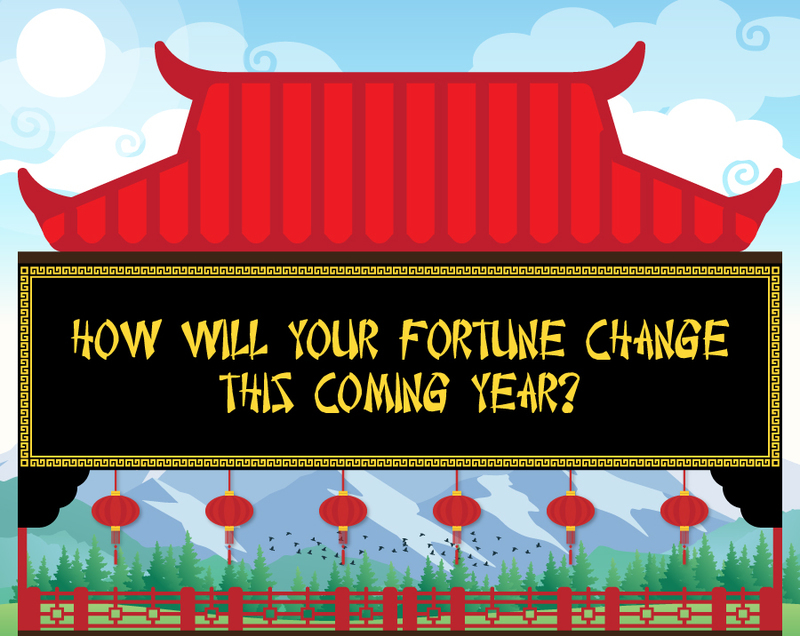 The gathering of major lucky stars provides a surge of good fortune and prosperity for you. 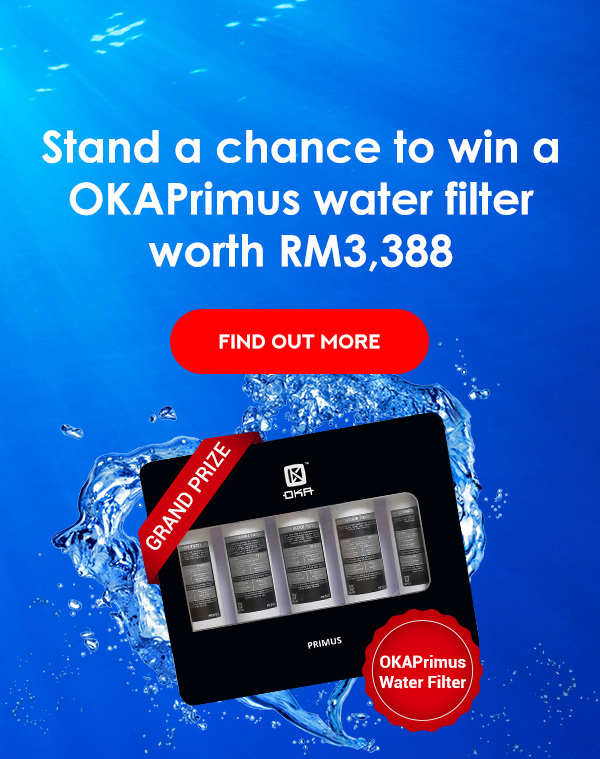 This year, you're assured of good health and improved career, wealth and studies. With your kind nature, there will always be someone to help you when you need it. Conversely, you may face obstacles in your romantic life; thus, avoid quarrels over insignificant matters. Remain modest and do not show off your good fortune, lest you become the target of crime. Your studies shall be the most promising aspect of your luck this year. Your learning is compromised only by the unlucky stars hindering other aspects of your life. 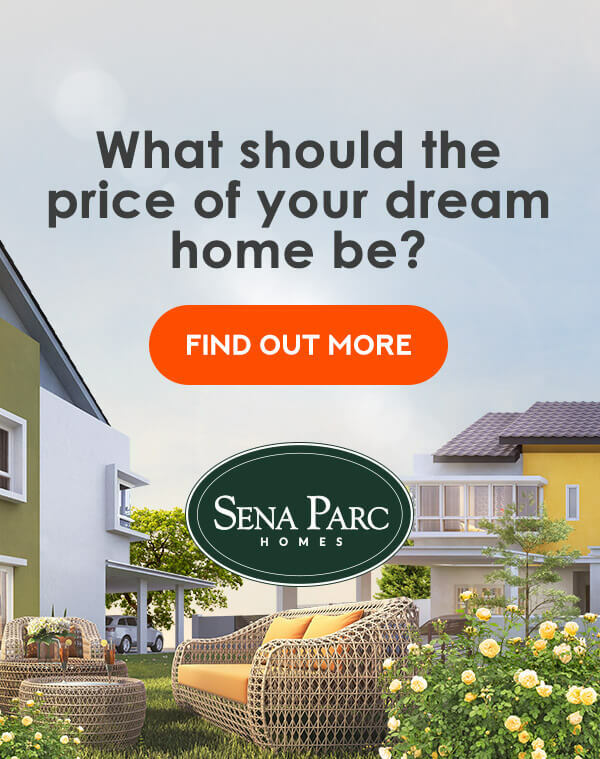 You'll likely perform well and see progress in your career and investments, but beware not to become greedy and attempt unlawful routes to success. There may be possible illness or disaster, so prioritise your safety and well-being at all times. 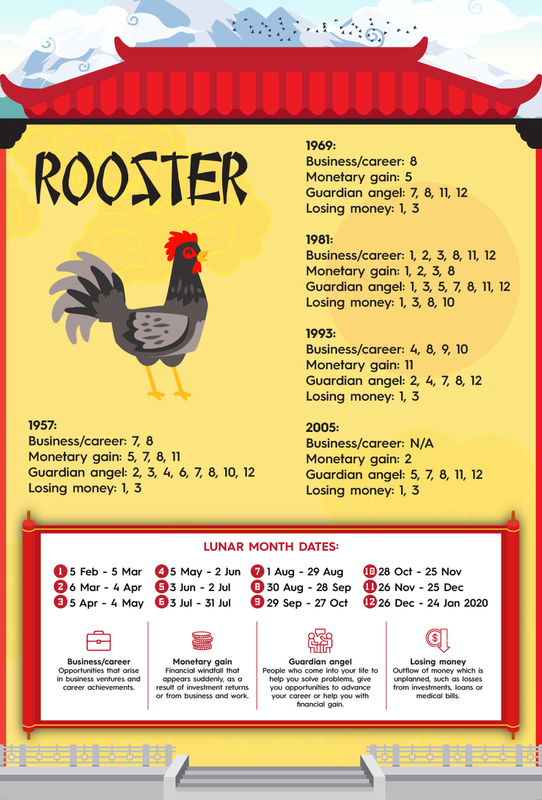 Your overall luck this year is nothing to shout about, and although various unlucky stars plot your misfortune, they're not powerful enough to cause major harm. This is the time for life events like marriage or starting a family. Protect against the harm of unlucky stars by keeping fit and healthy. You're easily affected by events outside your control this year, so avoid moving house or attending funerals. 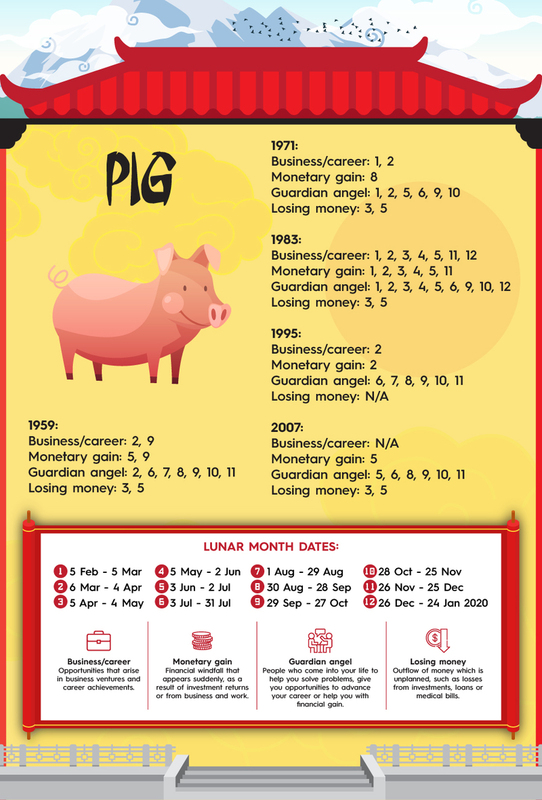 2019 shall be a year of upheaval for those born in the year of the Pig, as you'll clash with the Grand Duke and lie in the shadow of several unlucky stars. Fortunately, there are several lucky stars which will help you ease the situation and aid in reducing the negative gossip. A lack of motivation at work will cause your wealth and career luck to go downhill, so this is the best time to get out of your comfort zone and take on new challenges. 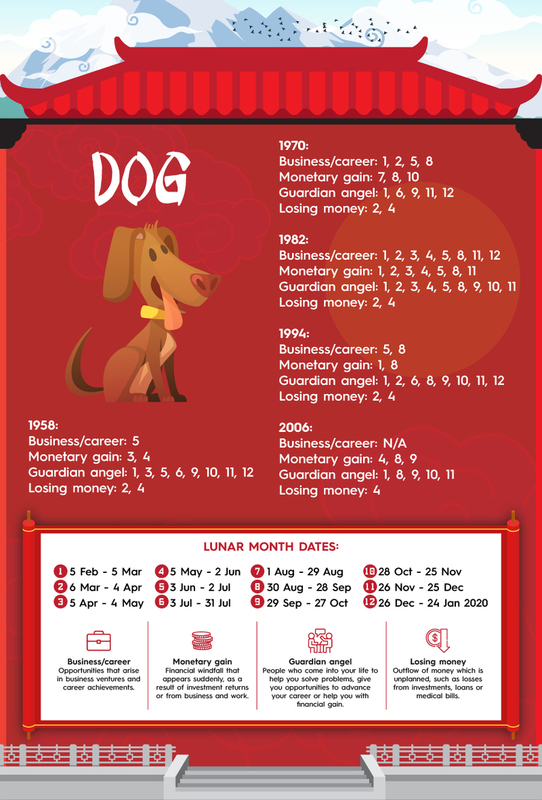 If you find that this infographic speaks to your inner (Chinese) animal, make sure to share it with your family and friends so they, too, can check their fortunes for the year of the Pig 2019!